Where to begin? An apology for last week’s lack of a post is in order for sure. Sorry about that. 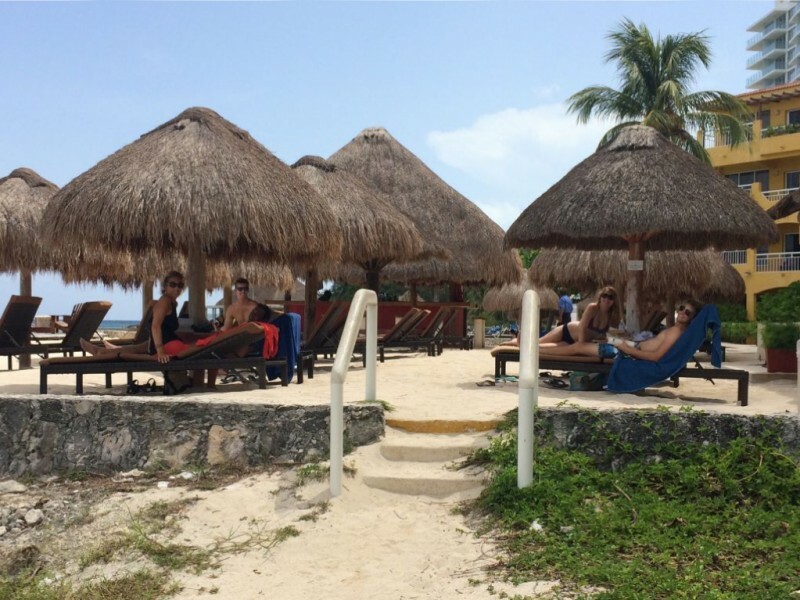 The family and I headed over to the beautiful Mexican island of Cozumel for a little rest and relaxation. Part of the plan was to bring my laptop and write a short post. I took some advice from Mike D. and once there decided to try and forget about everything going on in my everyday life and just enjoy the time with my family. It was really nice there and very relaxing. What a lovely place. What lovely people. I think I’ve never been on a vacation where the host countries people were so friendly.What a pleasure. What nice people. I can’t say it enough. Relaxing under the palapas. The Editor ,Ethan, Jude (barely noticeable) Georgia, and Terence. We visited the Ancient Mayan City at Tulum. You’re never going to guess who we met there. 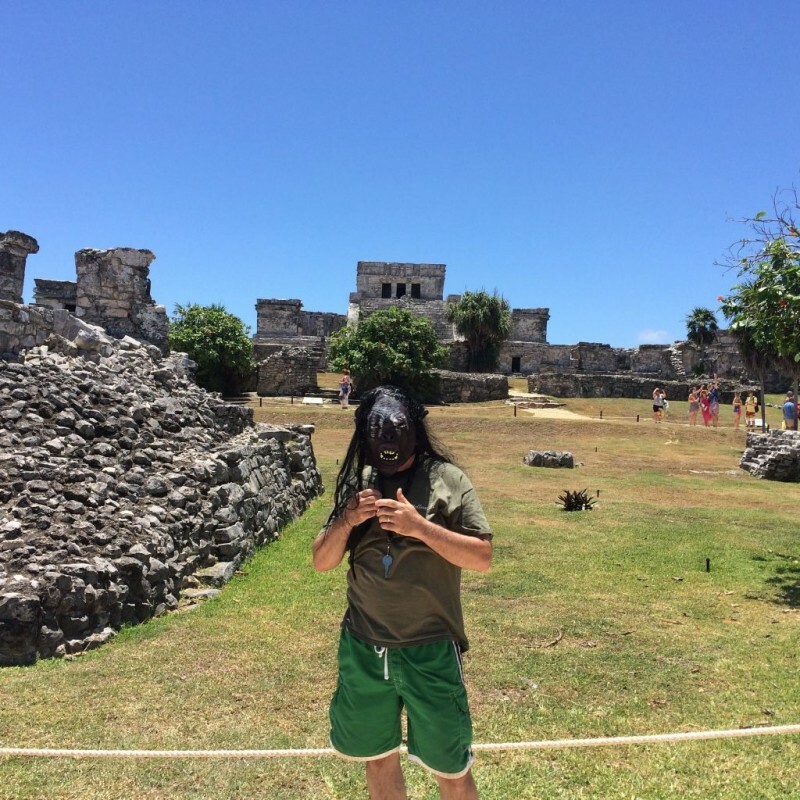 Bob on vacation touring the Mayan City of Tulum! It’s a small world isn’t it. I’ve been looking for this guy for months! The water was absolutely gorgeous there. So I know I told you in the previous post that Terence had mononucleosis and that he had turned into a grub. He has since gotten quite a bit better and doesn’t look so grubby anymore. (You know pale, white, and just looking at him would make your stomach turn.) I commented to Sally H. that the original plan for last weeks post was to cut and paste a picture of a grub sitting in our living room watching tv. The only problem was that when I googled pictures of real grubs they were so hideous and revolting that I couldn’t bring myself to do it. This is true Terence is on the mend and was able to do a few dives with us in the crystal clear waters of Cozumel. He’s half the grub he was. But then something happened that the vacation did not intend……a metamorphosis of a different sort. Yes people, a transformation if you will from one creature to another. So subtle it was that no one was quite aware it was happening. But happen it did. I turned into a toad. At first I didn’t believe it. Then I was flat out denying it. The final wake up call came when I actually used my tongue to try and catch a fly. Weird. 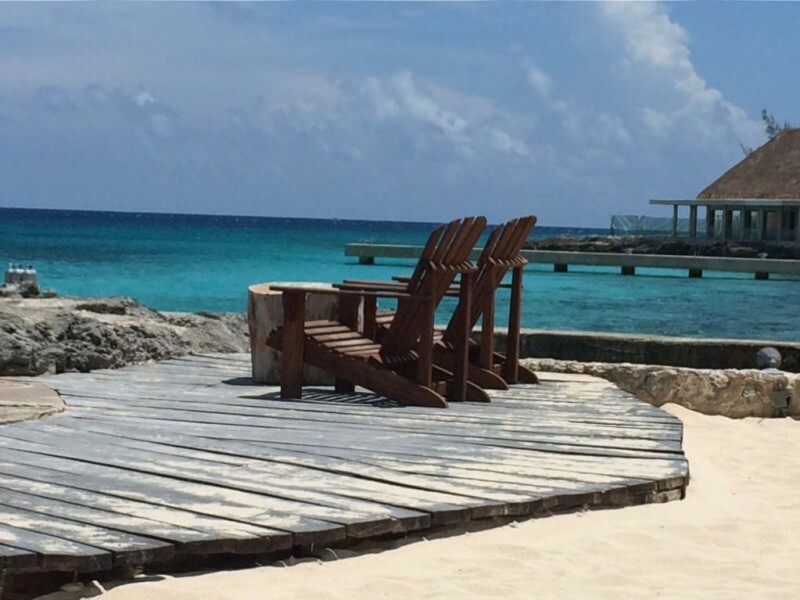 The problem was we went to this little old all-inclusive resort on the North West coast of Cozumel. The food was fantastic and the bar was about 15 steps away from where we set up our base camp every morning on the beach. I’m not a pina colada guy in general but these pina coladas were the best I’ve ever had. Anybody out there have any idea how many calories are in a pina colada? A lot more than the amount you burn walking 15 steps to the bar and back to your chaise lounge, I guarantee that. They think you’re nuts Jim. Going on and on like this. That’s probably not very far from the truth unfortunately. But seriously I think the big pouch under my chin kind of gives me a more regal look. You know, like I’m someone of importance. Bottom line is I think I gained about 12 pounds on this vacation. That’s a personal record. The good thing is that I don’t need to eat for 3 to 4 months. I just have to find some loose dirt or a thick bed of leaves so I can bury myself temporarily for the winter. That shouldn’t be too hard. You’re spending way too much time on the toad thing Jim. This construction blog is really turning into a bit of a shambles isn’t it. Isn’t it????? As you’ve probably already guessed we didn’t get a thing done last weekend as well as this one either. So there’s not a lot to talk about on the construction front as of late. The only thing I did do was keep going with my Instagram posts. It’s pretty simple and you do it from your phone so I did post a couple of pictures on my hobbithollowjim account. So with an ounce of luck maybe we’ll be putting in one of those big bedroom windows next weekend! Take it easy and enjoy your summer! Bob found his way to Cozumel !!!! Hey Mike! Yeah vacation was awesome. Took your advice and tried to let everything go. It took a few days to be honest. Somehow I lost track of Bob and Steve. Not really sure what happened there.